Touchscreen tablets are nifty bits of kit, don’t you agree? Lighter, easier to carry around and more convenient than PCs or laptops. They’re even easier to use in a lot of ways, too. No wonder they’re becoming hugely popular, even amongst people who aren’t PC experts by any means! They’re different from PCs. So even if they’re easier, if you’ve already learnt to use a PC, you have to start again. There are quite a lot of important features that you can’t possibly work out how to use unless someone tells you. Things where you have to “swipe in” from a particular side of the screen – but there’s nothing to show you that’s what to do. Or where you have to make a particular “gesture” on the screen with your fingers. These are things you simply can’t work out. It’s not like a PC where if you’re trying to do something in a program, there are probably some buttons and you can try clicking them and see what happens. If you don’t know the “gesture” to use, you can’t do it. Of course, you might think “No problem, I’ll read the manual that came with it” But first of all, to get at the manual that comes with it, you need to be able to use the device. It’s stored in the device, not printed on paper. So it’s no use unless you can already use the device! Even worse, the manual that comes with it is written by people who assume you already know what you’re doing – which makes it a bit pointless. If you already knew how to use the device, you wouldn’t need to read the manual, would you? iPads One Step at a Time and Android Tablets One Step at a Time. They’re almost the same book, really, but specific to either Apple’s iPad or the different types of tablet that use Google’s Android system (for example Google’s own Nexus range, Samsung’s Tab range or even Amazon’s Fire). That way you can get one that matches whatever tablet you have or are thinking of getting. These books explain exactly how to use the tablet – where on the screen to tap, what gestures to use and where important options are hidden away. It’s all explained in plain language, rather than complicated jargon. Occasionally if I have to use a technical word, I’ll explain what it means first. And there are lots of pictures of the screen, showing exactly where to tap it, making it really clear and easy to follow. Why you should be making gestures at your iPad/Android tablet – and I don’t mean rude ones! Funnily enough, if you don’t do what’s on the bottom of page 9 (10 for Android), your battery runs down faster. Editing photos sounds a bit, well, dodgy. Like you’re going to take a photo of a big group of people and edit some out so it looks like they weren’t there. (That would never happen, surely…) But it’s handy for things like brightening up a too-dark picture, cropping out an ugly lamppost just at the edge or straightening a wonky angle. Here’s how to do it on the iPad or Android tablet. You can also connect your tablet to your TV, so you can watch things you have on the iPad on a big screen. This is what you need (not expensive). I remember when ebooks first came out, I wasn’t convinced. “No-one wants to curl up by the fire with a big heavy laptop” I said. True enough, but a tablet is much better for reading books on, and you can have as many books as you want on one device – great for holidays or long journeys. Here’s all about the built in ebook system. Lots more, of course. I can’t fit it all in here! Part of the problem people have with these devices is that it’s not always obvious how to use them. The frustration when something won’t work the way you’d expect… or it simply doesn’t seem to work at all! The other problem is that it’s not obvious what they can do. There are thousands and thousands of “apps” out there that let your tablet do all sorts of things. Many of them are even free! But if you don’t know about them, you don’t know what they do. And you can’t try them all. That’s why I’ve published another book as well – a sort of companion to the iPad and Android tablet books. It’s an 80 page book covering the apps that I think you might find useful. The main types of app that are worth knowing about. It tells you what’s out there and how to get hold of it. And then how to use them, what they do and most importantly why you’d want to! Finding your friends on Facebook – you can use this to find people you know are on it… but also to track down people you lost touch with years ago – very handy. Every few months, the newspapers get a bee in their bonnet about Facebook and privacy. Here’s what you actually need to know to keep your information safe. Using your tablet for free video phone calls with Skype. Mum and Dad use it to talk to me, my brother and sister… and it means they can see my two little boys and chat to them more often than when we make the trip from Cumbria to Plymouth! I find it works better on a tablet than a PC. Last night, with both of us suffering from rotten colds, Julie and I went to bed early and watched some old episodes of “Restoration Home”. The TV’s in the lounge, so we watched it on a tablet. Tablets are ideal for this kind of thing, whether you’re watching a programme that’s on now, or one you missed. One app I would recommend everyone downloads for peace of mind, even if you never use it. And no, it’s not an anti-virus or web security app. If you’re going on holiday (or thinking about it), I’d recommend this app. Just ignore the review I mention on the left! This seems almost magic: language translation where you can even talk into it and have it speak the translation. And lots more, from “Do you really need anti-virus software?” to how to use your tablet as a sat-nav or playing chess or Suduko on your tablet. Who are these books suitable for? Why don’t the manufacturers do this? I really think these are the sort of books all tablet makers should include with their devices, to help people make the most of them. After all, if you buy an iPad new, it costs anywhere between £300 and £600 for a full size one. Other tablets are often a bit cheaper, but not exactly loose change. So it makes no sense to have this expensive bit of kit and not know how to use it properly. It’s like buying a car for the first time and no-one telling you it has more than one gear. I don’t mean that you should learn every last little detail – that can be left to the geeks and techies! But it’s worth finding out what things it can do, so you aren’t missing out on things you’d find really useful or interesting. If you order one of the One Step at a Time books (either the iPad one or the Android one) and the Apps book at the same time, I’ll also throw in a free gift. It’s a copy of a booklet called: A Tablet Assortment: Little-known tricks, tips and handy facts that make using a tablet much easier & make it work better. Not the snappiest title, I know, but it “does what it says on the tin”. It’s full of tricks that aren’t specific to one particular tablet, but that can make it easier to use or make it work better. For example, what to do if it’s running slowly because it’s nearly full (you might not have even realised that was why it was slow!) How to make your battery last longer. What “Push notifications” are, why you should care and how to banish them from your life! It’s only a short booklet, but the information you’ll discover in it can be really handy. And if you order both books now, I’ll give you a copy as a thank you. I mentioned iPads typically cost £300 or more. And even the cheapest tablets I’d recommend typically cost around £100 – most are significantly more. I would think the books are great, of course! And even though dozens of people have written to me saying how much these books have helped them, don’t take my word for it. Order a free trial set now, and you don’t have to pay a penny until you’ve got the books and decided that you’re happy with them. Otherwise send them back to us and owe nothing. (But you can keep the free booklet A Tablet Assortment: Little-known tricks, tips and handy facts that make using a tablet much easier & make it work better as a thank you for having a look). Whether you have an iPad or a tablet that uses Android, find out how to use it with no frustration – you can be the master, not it! Everything explained nice and simply, in plain simple English – with pictures of the screen showing you exactly where to tap or swipe and so on. 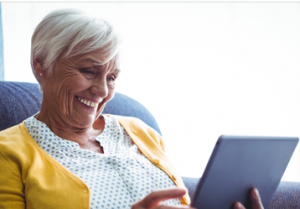 Find out the things you could do with your tablet and would like to do with it – if you only knew it could! That’s where the Apps book, Get More From Your Tablet: 62 free apps that mean your tablet can do all sorts of things, comes in. Get a free handy booklet A Tablet Assortment: Little-known tricks, tips and handy facts that make using a tablet much easier & make it work better. You don’t have to pay anything unless you’re happy with the books. Otherwise, send them back, owe nothing and that’s an end to the matter. No longer get frustrated by your tablet – by it not doing what it should or by just not knowing how to do what you want. Picture knowing exactly how to use it… and knowing what it can do for you (and how). And if you ever do get stuck, you can just pull out the book, flip to the relevant page, and there it is. Make using your tablet as easy as it should be. And find out what you might be missing out on that it could do for you. It’s worth deciding now. In fact, if you’re not sure, instead of deciding now, why not get a free trial set? If you’re not happy, you can send it back and pay nothing. Either way, you get to keep the booklet as a thank you for having a look. Or give Jess, Emma or Michelle a call on 01229 777606 and ask for the tablet books. We’ll get your books in the post straight away! Best not leave it for another day – you might not be able to find the webpage again. And remember, you’ve got nothing to lose – if you’re not happy with the books you can keep the free booklet, return the books and pay nothing. Why not at least get a set to have a look at. Just click here or ring 01229 777606 if you prefer to talk to a human being! If you’re not sure whether your tablet is an iPad or an Android one, there’s more info to pick the right book when you click on the order page. 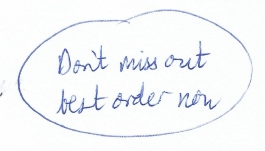 (And if you did order the wrong one by mistake, we’ll exchange it at no charge).